You can select up to 4 travelers in total. 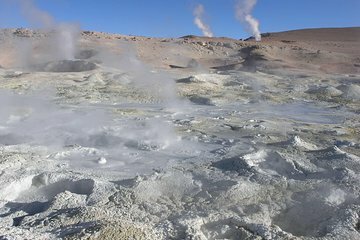 You need to make an early start to see the Tatio Geysers at their best, so leave the driving to your guide. Get picked up from your San Pedro de Atacama hotel and, before you know it, arrive at the geothermic field to view the spouting geysers as the sun rises. After taking in the spectacle, take a dip in a thermal pool, where the waters reach 104 F (40 C) to rejuvenate, then enjoy breakfast with a view before heading back.